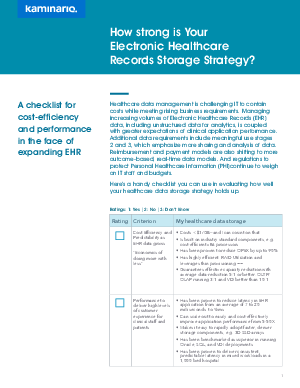 > White Papers > Kaminario > How strong is Your Electronic Healthcare Records Storage Strategy? Healthcare data management is challenging IT to contain costs while meeting rising business requirements. Managing increasing volumes of Electronic Healthcare Records (EHR) data, including unstructured data for analytics, is coupled with greater expectations of clinical application performance. Additional data requirements include meaningful use stages 2 and 3, which emphasize more sharing and analysis of data. Reimbursement and payment models are also shifting to more outcome-based, real-time data models. And regulations to protect Personal Healthcare Information (PHI)continue to weigh on IT staff and budgets.